So we have just discovered that Samuel Whitney, my probable 4th great grandfather, had an illegitimate daughter named Mary Smith that he recognized as his heir. When I saw her name was Mary Smith, I said to myself, "Mary Smith. Why did her name have to be Mary Smith?" I said it and felt it in the same way that Harrison Ford describes how he doesn't like snakes in the movie "Raiders of the Lost Ark." I have nothing against Mary personally. Shucks I don't really know her. It's just that Mary Smith has to be one of the most common names of all time! LOL. Oh well. Something happened yesterday though that makes me think that Mary herself may have given me a little nudge to figure things out. While I was writing, I had a few different tabs open on the computer so I could flip back and forth between reviewing the text of the estate record, writing my blog, and checking my email. Anyway, while doing this Google Chrome crashed so I had to bring everything back up again. 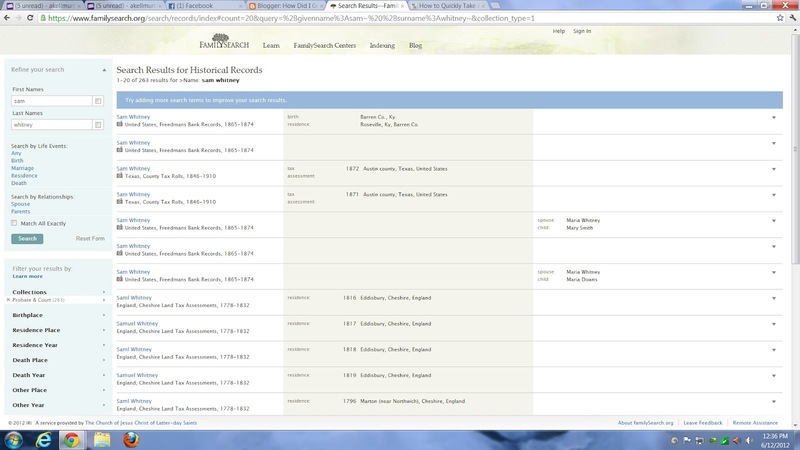 When I went to go back to FamilySearch.org to bring back up Sam Whitney's estate record, I was in a bit of hurry. In the past, I would simply type in his name and then type in Craven County in the appropriate fields and hit enter. This time I hit the enter button after just writing his name so it brought up tons of entries for all things related to Sam Whitney. To get to where I needed to go, after this I clicked on the area where you can filter down your results. 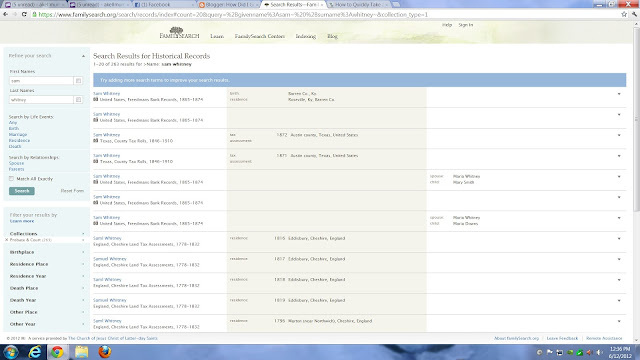 I clicked on collections and then probate and court, to get back to the estate record. Well, when I did this this time, an interesting thing came up. 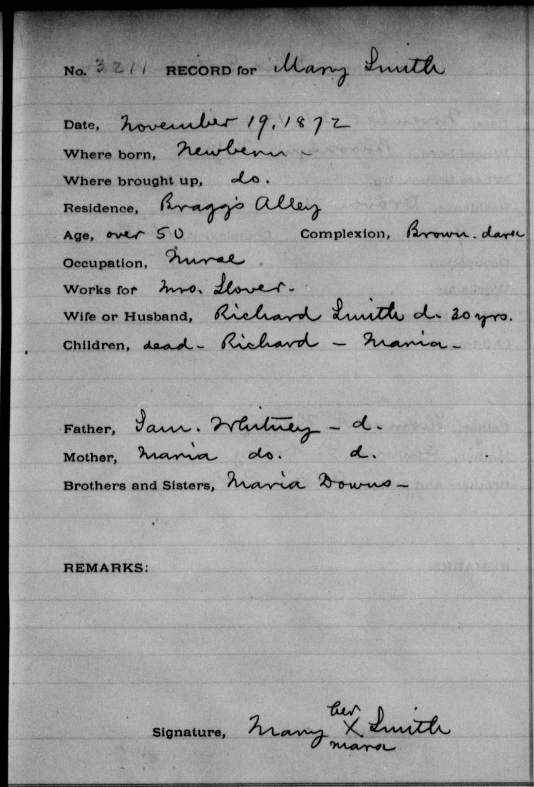 I noticed that a result came up for a Mary Smith in the Freedman's Bank Records where the father was listed as Sam Whitney. Wife or Husband, Richard Smith d. 30 yrs. Children, dead -Richard - Maria. Father, Sam Whitney - d.
Brothers and Sisters, Maria Downs. So it looks like I have some new leads to investigate. Thanks Mary! This is awesome! Richard Smith very common name sounds familiar to me. Excited about your result and the the discoveries to come. Thanks Yvette. Good things are coming about from me revisiting my Whitney line. More to come. This information came directly from Mary, what an excellent source. You do have new leads. Hope the leads are fruitful. I feel the same way. I love it when the ancestors are looking out.